Aarthy Sundar, a former Dirty South Dandiya and Texas Raas member, double majored in French and supply chain management for her undergraduate degree and graduated from UT Austin in 2016. Initially, she studied business but realized her passion was speech-language pathology. Speech-language pathology is a constantly growing field in health care that assesses and treats social and cognitive communications disorders. She is currently pursuing her master’s degree in speech-language pathology at UTD’s Callier Center for Communication Disorders. After her graduation in May 2018, she will begin her clinical fellowship as a medical speech-language pathologist and hopes to pursue a PhD in rehabilitation sciences in the coming years. Swathi Jaisankar, a second year undergraduate student at Boston University, is pursuing a degree in Computer Engineering. Her studies were inspired by her longtime interest in both math and science. She feels that engineering is about finding and utilizing the resources around you to produce practical solutions for various problems. Swathi values the innovative thinking and problem solving that engineering challenges her to partake in. After she graduates, she plans on working in the technology industry, while simultaneously going to gradate school to receive her MBA. She believes that engineering traverses beyond just technical abilities and is also about creativity. Through pursuing an MBA, she hopes to further develop creative methods for employing engineering. She believes that many individuals forget the interconnections between dance and other routine aspects of their lives. Swathi views dance as an art based on creativity and that the ability to develop real-world, real-time solutions is an art as well. She says, “The way we define art is interesting and dance and engineering really push those limits to create something amazing in my life.” Swathi intends on continuing her dance journey by continuing to take classes, performing, and teaching. She strives to redefine dance as something more meaningful in her life by utilizing dance as a platform for social messages. What styles are you trained in/have exposure to? Aarthy: I have been training in Bharatanatyam since I was nine years old. I completed my arangetram in 2010, under my guru Smt. Madhusri Sethuraman, and I am currently receiving advanced training under the able guidance of Smt. Janaki Rangarajan. 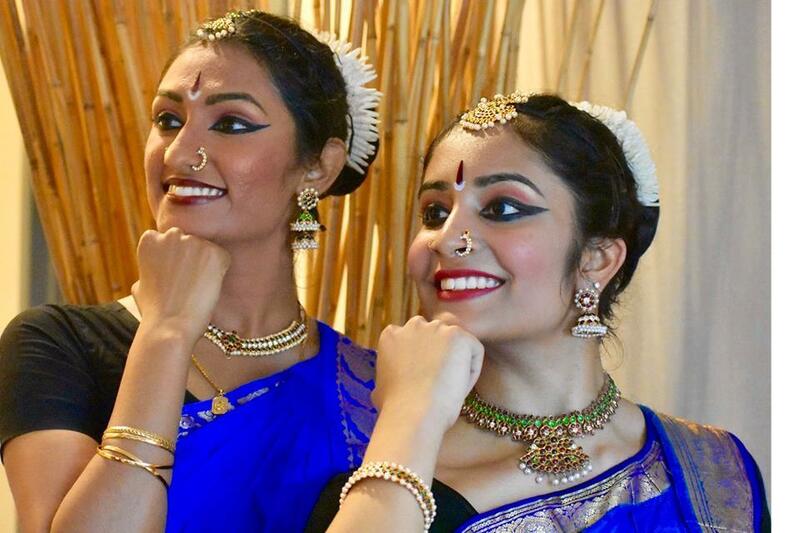 In the years I have been doing Bharatanatyam, I have performed numerous times, in groups and as a solo artist, in cities all around the U.S., as well as Chennai and Delhi in India. In addition to performances, I have also competed in classical arts competitions, such as the Cleveland Thyagaraja Aradhana, where I was a finalist in 2015, as well as the Saptami Foundation, where I was a two-time Saptami Star, winning a solo spot to perform in Chennai this year. Over the years, I have been exposed to many different styles of the artform through workshops and classes conducted by leading artists in the field, such as Smt. Rama Vaidhyanathan, Sri CV Chandrashekar, and Smt. Shobana Balachandran. I also have a lot of exposure to raas/garba, as I was on DSD in college, though competition raas is very different from traditional raas/garba. Being on DSD defined my college career and the skills and experiences I gained as a choreographer and dancer on the team, along with 19 other members, each year are invaluable. My passion now is to use my dancing as a platform to showcase important social issues and enact change. A recent production of mine in 2015 that I co-choreographed and conceptualized along with a dancer friend, Ekashree, was constructed around the theme of women empowerment. All the ticket proceeds for the show went to a charity for women and children of abuse. I hope to continue bringing more relevant issues to light with my art. Swathi: I started taking ballet, tap, and jazz classes when I was four years old. A few years later, I started taking Bharatanatyam classes as well. At one point it got to be too much, I had to decide between these dance styles and I eventually chose to transition my focus on Bharatanatyam. I realized that I did not have many connections to my Indian culture and heritage, and that doing this would be a way for me to connect back to my Indian roots. I have trained in this classical Indian dance style for the past fourteen years, under the guidance of my Guru Smt. Suba Parmar in New Jersey. After completing my Arangetram in 2014, I started competing intensely and won many accolades, such as being a Two Time YoungArts Winner (2016 & 2017), Finalist of the Cleveland Thyagaraja Festival (2015), winning the title and award of “NJ Natya Shiromani” (2015), and winning a solo performance slot in Chennai after having won First Place in the NJ Natyanjali Competition (2016). During my senior year of high school, I wanted to explore more styles of dance, so I starting taking Bollywood and Contemporary dance classes as well. Soon after, I joined Boston University Jalwa, which has exposed me to multiple dance styles such as Bhangra, Contemporary, and Hip Hop. Who are your biggest dance inspirations, and why? Aarthy: I look up to dancers who truly make an impact in the field and push the boundaries of their creativity, while maintaining the traditionality of the artform. My biggest inspiration is Dr. Janaki Rangarajan, an accomplished dancer from whom I have had the privilege of learning. Her performances and productions delve deep into human emotions and actions that she portrays using the context of well known mythological stories. One of her latest productions, Unravelled, is a take on the unseen layers of Draupadi’s story, exploring strong, feminist themes and raising important questions about society today. Swathi: My biggest dance inspirations are Smt. Priyadarshini Govind, Smt. Rama Vaidyanathan, and Smt. Rukmini Vijayakumar. Their Bharatanatyam practices are not confined to a specific style, which I have seen first hand while attending each one’s workshops. They are all very accomplished senior dancers who I look up to, but one of my favorite dancers that I can relate to is Harinie Jeevitha. She is only a few years older than me, but she is one of the best Bharatanatyam dancers in my opinion. When I was preparing for competitions and performances, she was my main source of inspiration because of the amount of energy and cleanliness that she presents on stage. My dance teacher, Suba Aunty, has also been a large source of inspiration for me. She has not only given me a strong technical foundation, but she has also helped me develop my choreography skills. What made you want to be a part of IndianRaga and how long have you been with them? Aarthy: I discovered IndianRaga through a past fellow who shared one of her videos on Facebook. I was so impressed by the quality of the artists and videography, that I was thrilled to apply once I heard that IndianRaga was taking dancers for the first time in 2016. Following the very memorable 2016 Fellowship, I was invited back as a Creative Director to supervise and assist the next cycle of fellows in 2017. Swathi: After becoming a YoungArts Winner in 2016, I was looking for a platform in which I could collaborate with like-minded dancers. That is when IndianRaga was starting their first Dance Fellowship, so I applied and got selected as a Bharatanatyam Fellow. After a very successful and incredibly fun fellowship week in the summer of 2016 in Boston, seven of my productions were released throughout the following year. I was then selected as a Creative Director for the 2017 IndianRaga Dance Fellowship. I spent the much of the next year guiding the new fellows and their productions, while working on nine of my own pieces for the upcoming Fellowship as well. It has been an exhilarating journey so far and the best part is receiving encouraging and motivating comments from people, for these pieces that we have worked so hard on. For instance, one of my first releases from the 2017 Fellowship, Shiva Shambho, hit over a million views on Facebook in just ten days! How long have you two been dancing together? What has been your favorite piece thus far? Swathi: Aarthy and I first met in 2015, at an international music and dance competition, at the Cleveland Aradhana Festival. We were both finalists getting ready to perform our solos. Right before I was about to go on stage, I realized that my nose ring was missing, so I was frantically trying to find a replacement. Luckily, the girl sitting next to me had an extra one, and turns out that girl was Aarthy! It was such a surprise to find out that less than a year later, we were both selected as 2016 IndianRaga Fellows. Aarthy and I collaborated on multiple pieces during that Fellowship and continued to do so during the 2017 Fellowship as Creative Directors. Our favorite piece is the first production that we conceptualized along with two other talented dance Fellows, Vivek Ramanan and Surya Ravi: Nandichol - Bharatanatyam Jathi. This was really the piece that brought the four of us closer together as dancers and as friends. How did the concept of the LGBTQ performance arise? What made you both want to address this social issue in particular through dance? Aarthy: In joining IndianRaga, I knew I wanted to use this platform to present dance pieces that were relevant and raised important questions about social issues in the world today. Given the current sociopolitical climate, and the fact that the topic of LGBTQ is rarely touched by the classical arts, I wanted to first do a piece depicting the story of a transgender woman. Following the release of that piece, Reflections: Celebrating LGBTQ Stories Through Bharatanatyam, we realized that there are so many more stories to tell just within this topic itself, so we decided to make it into a series. “Coming out” is a unique experience that everyone in this community goes through, so we structured the piece around one such experience in the context of a mother and daughter, to show the emotions and reactions of both generations. How did you go about tackling the choreography and how did you determine who played what role? Aarthy: We first outlined the basic storyline of the piece and determined a beginning, middle, and an ending point to have a structure in mind. Similar to the first piece in the LGBTQ series, we thought we would stick to the same 3-part format played in three different ragams, with each part highlighting a very different set of emotions in the journey. After fixing the basic storyline, we worked with the musicians to use each raagam to bring out the particular mood and action happening in every scene. Once the storyline and music was set, it was a lot of trial and error to see what worked and looked natural, and what did not. As for deciding who played who, I definitely look older than Swathi (and I am), so we thought it would make sense for me to play the mother and for Swathi to play the daughter. Have you ever thought about performing this piece for a Tedx Talk? Swathi: Aarthy and I have not thought about performing this piece for a Tedx Talk, but we would love to get the opportunity to do so! This piece is one of our favorites from this Fellowship and it is one that we worked really hard on. We started conceptualizing Revelations: Celebrating LGBTQ Stories Through Bharatanatyam many months before the Fellowship began and it was a long process to get to our final product. There are so many little nuances and expressions that we worked to bring out on the video. At the same time we had to work with the videographers as well to make sure those nuances got the required shots and camera angles. We would definitely be interested in talking about this piece more in depth to explain our inspiration and conceptualization for a TEDx Talk! Swathi: With dance, we plan on continuing to innovate and be involved in more collaborations to come, hopefully with IndianRaga, the platform that made all of this possible. Based on the response, dance as a medium for social issues is clearly effective in starting a conversation about important topics and we hope to continue bringing more topics like this to the forefront. 1. I love noodles more than most things in life. 2. I am constantly trying to go vegan, but there really is not a viable substitute for egg. 3. Food is almost always on my mind. 1. My nickname on BU Jalwa is "Swaga" or "IndianSwaga," because of all the IndianRaga videos I post. 2. One of the little girls that I teach dance to once asked me "If I become a dancer, will my feet turn as gross as yours?" 3. I eat so much that people compare me to the demogorgons from Stranger Things. A special shoutout goes to our IndianRaga Director, Sriram Emani. You have really played a pivotal role in helping us come up with production ideas, motivating us throughout the whole fellowship process, and giving us amazing opportunities to showcase our dancing.